They give more information about the noun. They eliminate the need for the relative pronoun, useful if students have trouble remembering which one to use. Avoid repetition of relative pronouns. In this example we can exchange the gerund for a noun, such as ‘Chocolate’ and it would still make sense. However, we cannot exchange a present participle for a noun. Does it make sense to replace the word ‘sitting’ with ‘chocolate’? Of course not! There is your difference. The light which swings from the ceiling. The chef who is cooking in the kitchen. A castle which sits on the mountainside. The light which swings swinging from the ceiling. A castle which sits sitting on the mountainside. Using this emphasizes that the first action was completed before the second action started. It is a form of the present participle. Having enumerated the problems, he started talking about solutions. It is common for students, and even natives, to put a preposition before the participle, but this is incorrect. It is not necessary to put anything before the verb. After having enumerated the problems, he started talking about solutions. This is formed by the past participle (third form of the verb) and is used when the sentences has a passive meaning. The note which was given to me by Sarah. The book which was written by Charles Dickens. The artwork which was done by my class. To use a participle clause here, we need only remove the relative pronoun and the verb ‘to be’ from the sentences. Easy peasy! It’s generally better to use the regular relative clause instead of the participle if it’s one particular action that is not repeated. The man who put the coffee on the table. If the subject and the object in a perfect participle clause are not the same, the sentence may be a little confusing, or even funny! So make sure to clarify! Students often get confused with the difference between a present and a past participle. Thinking that one has a past meaning, and the other a present one. As you can see above, it has nothing to do with past or present, the difference is whether the sentence is ACTIVE or PASSIVE, don’t forget to clear up any doubts! 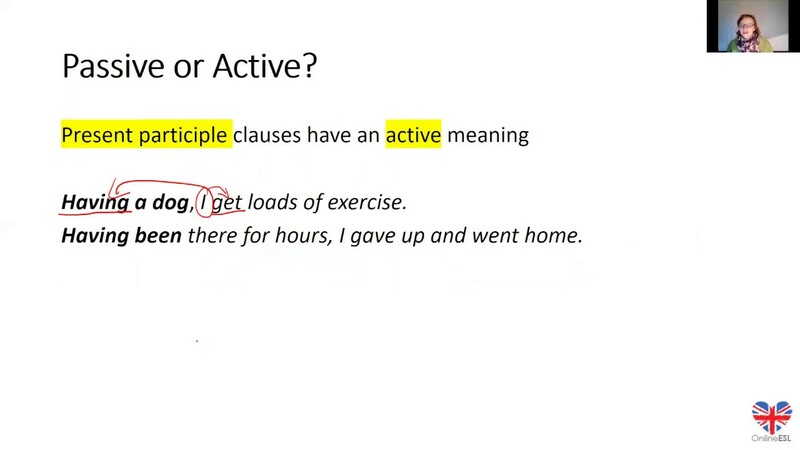 Any more tips for correct participle clause usage? Let me know in the comment section!